Taking diners beyond the usual suspects, such as mutton stew, appams and fish moilee, is restaurant Ente Keralam, with their Syrian Christian food festival. Known to give equal importance to all kinds of meat, be it beef, duck, pork, chicken or seafood, the cuisine is said to reflect the heritage of the community, whose origins can be traced back to St Thomas. Helmed by the culinary expert Aleyamma Paily from Kuravilangad, Kottayam, the menu offers detailed descriptions of each dish, with notes on the culture and traditions of the community. Settling in after an unnecessarily long drive, in the unusual winter heat no less, we took respite in a tall glass of coconut water with a dash of lemon juice, sweetened with honey. Before you tuck into the decadent spread, we suggest you make a stop at the ai?? ?petti kadaiai??i?? ai??i?? complete with sweets and snacks, reminiscent of little tea stalls in villages and small towns. It took over two weeks and hours of research (including travel to villages in Kerala, Tamil Nadu and Karnataka) to put together, weai??i? ?re told. Not for the fainthearted, the Kakka irachi fry is a fiery dish made with clam meat. SautAi? ?ed with onions and aromatic spices, it is sure to have you reaching for a napkin. However, it proved to be a hit. Kanava peralan or squid rings cooked with a tangy onion and tomato masala is a lot less pungent and allows the flavour of the squid to shine through. The Kaada fry or deep-fried quail is easily one of the most impressive dishes. Cooked to perfection, the crisp marinated skin combined with the soft, succulent meat is definitely moreish. Aatirachi kurumulagittu olarthiyathu or mutton fry, pairs the red meat with a freshly ground black pepper and coconut masala. Ask for their soft kallappams (appams cooked on a flat griddle) to soak up all the peppery goodness. For mains, donai??i? ?t miss the Erachi puttu (steamed rice cakes with beef) and Erachi chertha kappa puzhukku (mashed tapioca cooked with beef).While the former is usually eaten with ripe banana or Bengal gram curry, the latter is paired with tangy fish curry. The versions presented at the festival are not as well-known, but pack a punch nonetheless. The dessert section, though limited, does not disappoint. 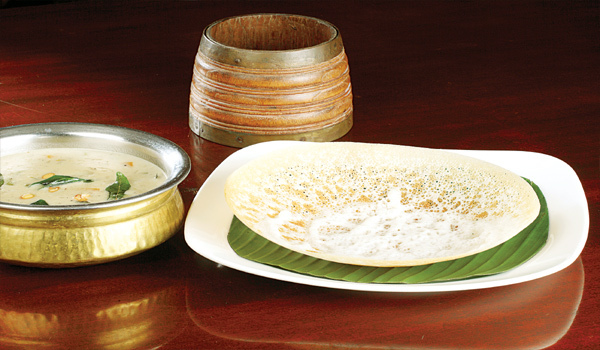 Apart from the quintessential payasam, the menu includes lesser-known creations such as Neyyil vaattiya eatha pazhavum thengayum (slices of banana fried in ghee before being tossed with coconut slivers and sugar) served with vanilla ice cream and Vattayappam (a steamed spongy cake made with rice flour, coconut and sugar and flavoured with cardamom).